“There is no passion to be found playing small – in settling for a life that is less than the one you are capable of living,” said Nelson Mandela, South Africa’s first black president, a Nobel Peace Prize winner and a remarkable leader. Apart from their exceptional skills and talents, one of the major factors that contribute to the success of powerful businessmen, high-achieving leaders and other extraordinary individuals is their ability to think big. They have a clear and compelling vision that they are working towards, and their day-to-day actions are consistent with that vision they have in mind. Do you know where you want to be 10-30 years from now? Do you have a big vision that drives your decisions and life choices? If your career goal is limited to ‘getting a job, ‘getting promoted’ or ‘earning a higher salary’, then you won’t get too far in your professional life. You’ll lack the grit to get things done, the strength to push through your fears. You’ll settle for a life that’s less than what you deserve. What you lack is not talent, skill or intellect; but a bold vision statement, a BHAG (Big Hairy Audacious Goal) as Jim Collins calls it in his book ‘Built to Last: Successful Habits of Visionary Companies’. Having a vision for your professional life is essential, no matter which stage of career you are in. 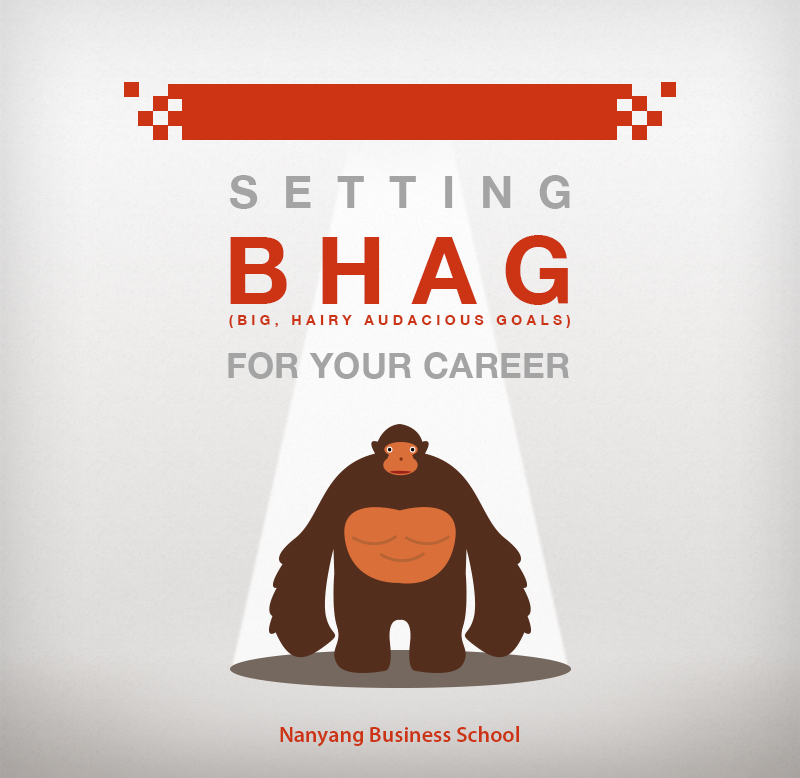 So, here are a few steps to help you set BHAGs for your career. “Becoming a CEO of a technology firm”, “Running a retail store that sells rare electronic goods,” “Building technology tools that make education accessible to every child in the world” – your BHAG may seem out of reach, but it’s not out of sight. You can visualize it in your mind, although it may seem complex and daunting at first. Know that it’s the challenge that makes it worth achieving. Aim high and do not settle for a goal that appears too easy and comfortable. The BHAG should be something that you truly want to do. It should be emotionally compelling to you and well aligned with your passions. Think deeply and get to the core of who you are, and where you see yourself a decade or two from now. It takes relentless effort to achieve your big goals. Choose something that you must do, not something that you think you should do. BHAGs are big dreams with a specific deadline. The time limit adds a sense of urgency and pushes you towards the goal. But, they are not goals that you are meant to achieve in a short span of 2-3 years. It may take a decade or longer. So, be prepared for a long, immersive and deeply gratifying ride. So, you have set a BHAG for your career. You have pondered over it in depth, written it out on a sheet of paper, and stuck it up on the wall over your desk. Is that all? Do you go about your life as usual? Creating a vision is not enough. You have to abide by the vision, make your present actions and choices consistent to it. You have to work hard towards that vision, break the big goal into small steps that can be achieved over a period of few months or years. You have to shield yourself from day-to-day distractions, not let yourself be deterred by the hurdles that you face on the way. Working towards a Big Hairy Audacious Goal isn’t easy. And, if you don’t have a support system around you, you are likely to falter and feel lost. Find mentors; join hands with other like-minded individuals who are working towards their own BHAGs. It would keep you inspired and help you stay positive and hopeful. If your BHAG is to be a successful business professional, then the Nanyang MBA can help you achieve that goal. The 12-month MBA programme will help you expand your business knowledge, build your leadership skills, and work under a guidance of qualified international faculty and senior level industry experts. To know more about the Nanyang MBA Programme, visit: www.thenanyangmba.com.